Click here to check out the piece. 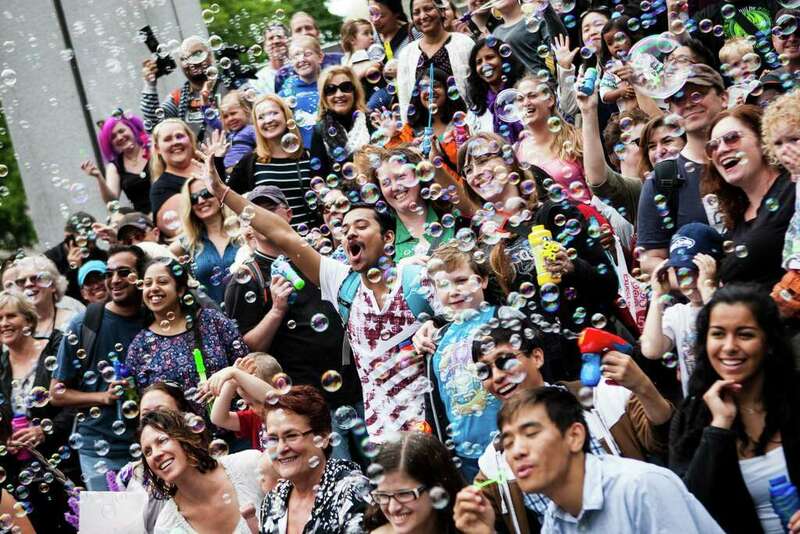 A bubble flash mob broke out at Westlake Park on Saturday. Why? Because who doesn’t love bubbles? A woman blows vapor into bubbles during the International Bubble Flash Mob at Westlake Park in downtown Seattle on July 9, 2016. The flash mob lasted 30 minutes in both Seattle and London. 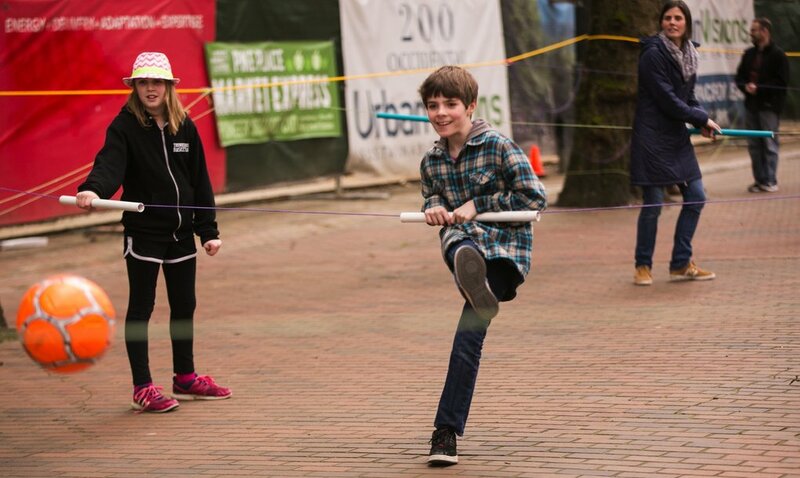 Gabe Vannelli, 12, center, plays a game of Human Foosball at Occidental Square on Friday in Seattle’s Pioneer Square neighborhood. The activity replicated the popular the tabletop game. 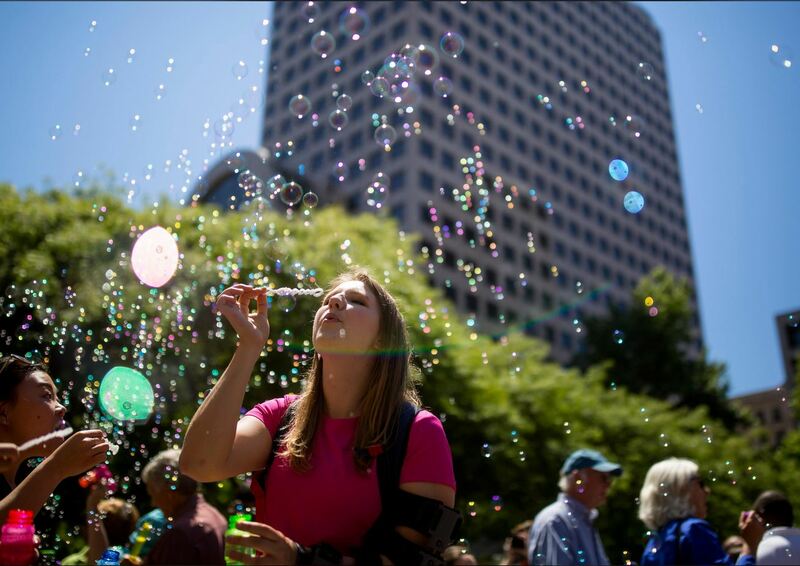 The Downtown Seattle Association co-produced the event with Bubble, part of DSA’s ongoing programming and activities in Occidental Square and Westlake Park. “You’re your own plastic player,” said the owner of Bubble. In soccer, you’re not allowed to use your hands. In human foosball, it’s mandatory. You need them to hold onto the rope. The setup was ingenious. Ropes were tied to each fence wall, with little handles that slid along them for the players to hold onto. When the ball came your way, you had to play it while staying on the line, just like the plastic figures on a foosball table. Human foosball is another in a long line of sports that have nothing to do with tennis being played on the tennis courts. It was organized by Bubble, a group that is “bringing back all the fun” of recess, except for the part when you were bullied. Their next event is a flash mob pillow fight. While similar, the human version was not quite like the real thing. The players did not wear the standard red and blue of their plastic counterparts. They moved their arms and legs (some even held onto the bar with one hand, which I think should be a penalty). And there was no way to shake the table in frustration. But like foosball, the good players did stop the ball before kicking, and at one point, a goalie almost knocked it into his net. All that was missing were giant wooden handles along the side. These players must at least be given credit for one thing: while plastic foosball figures have to stay on the line, human foosball players choose to. No word yet on when they’re playing human table hockey.